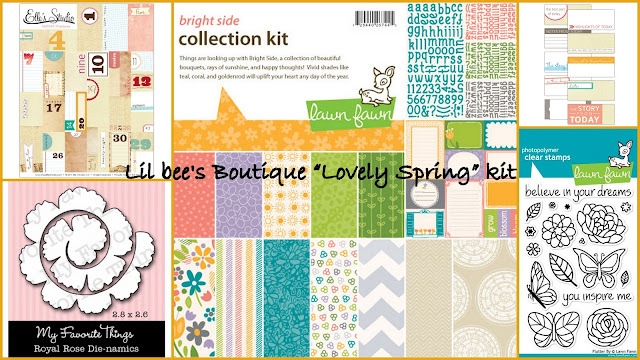 I am back with an overview of Lil Bee's "Spring Lovely" kit which as you know was released in May 2012. Before we see the details and snapshots, let me announce that the last product focus winner is Hussena! Congrats Hussena and please email your postal address on dml.dubai@gmail.com for your giveaway to be delivered. Now back to Lil Bee's "Spring Lovely" kit! The stamp in Lil Bee's "Lovely Spring" kit is from Lawn Fawn! Get ready to stop and smell the roses with this set of 17 clear stamps! These butterflies and flowers make a cheerful addition to your cards and crafts. Patterned Papers , Alphas and Tags in Lil Bee's "Lovely Spring" kit are also from Lawn Fawn's first Paper release in CHA winter 2012 release! So get crafting with this Bright Side collection. This lively assortment includes 12 double-sided papers, two kraft papers, and one cardstock alphabet sticker sheet. Exclusive in Lil Bee's "Lovely Spring" kit is Dienamics Royal Rose, an essential part of your diecuts collection! Tags in Lil Bee's "Lovely Spring" kit are from Elle's Studio! These tags are perfect for everyday moments and are full of beautiful colors with a vintage and handmade look. These are great for adding a special touch to your layouts! You can even slip them over photos in your photo albums! There are 10 tags total in this set. Each tag measures 3.5 x 1.5 inches wide and is printed with fun colors, on cardstock. Embellishments in Lil Bee's "Lovely Spring" kit are also from Elle's Studio! This sheet of numbers allows you to cut them out and glue them on! You'll receive one sheet of pennant tags that measures about 7.75 x 10 inches. There are 31 numbers total on the sheet, all ranging in sizes. Now Let's have a look at our DT Projects show casing Lil Bee's "Lovely Spring" kit! Love DT Teju Venkat's cards and Scrapbook layout! The Bright coloured papers are suitable for any occasion! DT Nandini Achariya has brought sunshine into this spring collection by creating visuals for the cards using yellow orangy color papers! I, DT Hana Atif have made this easel card with Silhouette . the butterfly has a body of American craft micro beads! all images colored with copics. Let's pause the overview here and come back tomorrow to view Guest designers creations and reviews! Will be putting up soon! Thanks Nandini!